Although Krishna was born in a royal family, he grew up in hiding from an evil king who, because of a prophecy, wanted him dead. Thus his childhood was spent in the company of the villagers who raise cows. This painting by B.G. Sharma shows an innocence and sweetness that defies the consciousness of the Kali Yuga. 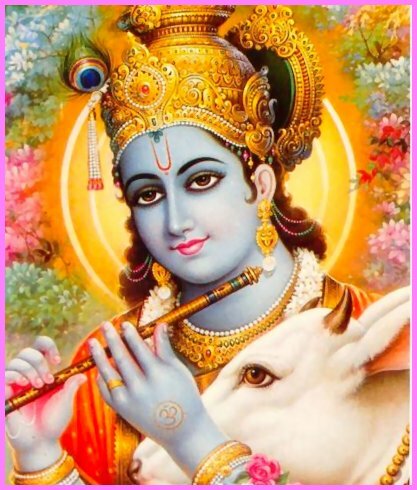 As a child growing up in the west I never heard about Krishna, the loving blue one who plays the flute. In my 1960s college days, I learned about the Bhagavad Gita and for many years tried to understand its meaning. As the years of my life passed, through both persistence and grace, the enlightened consciousness of Krishna’s towering wisdom in this ancient masterpiece at long last began to be revealed to me. As I felt the power of Krishna’s words in the Bhagavad Gita, I became ever more curious about him. The great Sanskrit epic The Mahabharata has enchanted me since the late 1980s, initially through the J.A.B van Buitenen Chicago University Press translation. This epic in my view is the greatest tale ever told. I was thrilled to find an enactment of this long complex story on DVD. Thus I entered the world of B.R. Chopra & Ravi Chopra’s 16-disc set of the ‘Mahabharat’ (Hindi with English & Spanish subtitles) – which I highly recommend. It was great to see the characters come to life through the excellent actors, beautiful costumes, fabulous jewelry, horse-drawn chariots, and palatial sets. I was intrigued by the fact that Krishna, who is played perfectly by the very appealing Nitesh Bhardwaj, is almost always ‘smiling’ in a rather god-like, detached, all-knowing and always loving way – no matter what is happening in the story. This further fueled my curiosity and I began to reread the sections in the text of the Mahabharata that concerned Krishna. It is as if Krishna is prescient and already knows the outcome of every move in this amazing epic and is adroitly guiding the players to their destiny. I had read The Bhagavata Purana with a keen but passing interest and was delighted by the endearing stories of Krishna’s life, which are primarily in Skandha X. However the more I read these fantastic and wonderful tales, I found myself mysteriously drawn into Krishna’s world. It was as if the stories themselves contained a consciousness that forced me to cultivate the heart of a child. I began to read them at night before I went to sleep because it gave me pleasure. The stories made me feel good. Krishna always makes me smile or laugh, or he fills me with joy and awe. Krishna is the embodiment of everything superb. He is the ultimate dream guy. He is everything you ever wanted in a lover, friend, son, mentor, etc. He is out-of-this-world handsome, he’s fun and funny, mischievous, fearless, the ultimate warrior and strategist, brilliant, a fountain of wisdom, the guy all the other guys want as their friend, he is that one all women want for their true love/husband and lover, he plays the flute and he can dance! Krishna’s activities here on earth are often described as his ‘sport’. The Oxford Etymological Dictionary defines the term ‘sport’ as play, merriment, jest; as in sportfully, sportfulness, sportive, sportively. You have to contemplate this one for a long time. We all take ourselves so seriously; our egos tell us how special and important we are. But for God, this universe is ‘sport’ - and as some have suggested, purposeless sport. God wraps Itself in the Illusion of Separation to play in Time & Space. Upon awakening and Remembering our true nature, we are amazed and astonished to realize that there is nothing but Bliss. All the struggles and efforts are but castles in the sand. We are all Ozymandias! The earth plane in not a ‘school’ in the sense that the God-within you needs to learn anything! IS-ness already Knows everything. It is the Totality of Oneness. Krishna embodies this Divine Play in every moment of his life. As I continued to read these stories, I felt my consciousness being swept up into a sort of never-never land, a Shamballa-like realm that exists eternally outside of time. For those of you who are familiar with the old musical Brigadoon, you know that this village in the highlands of Scotland only appears only one day in every 100 years – or Brigadoon can appear for the one who loves with a true heart. 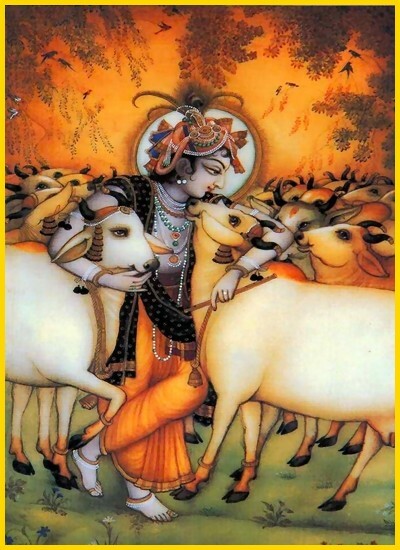 Krishna is the most loving of all men. Krishna is Love. I came to experience the locations where Krishna once lived in the same way. Beyond the remnants of these places that still exist in India, there is in Eternal Time a Vrindavan forest and a Dwaraka where the Divine Lila of Krishna’s ‘sports’ is always taking place. The experience of these realms brought me genuine feelings of love, happiness, grace, and bliss. I understood why Krishna is so popular. These stories of his life in the Bhagavata Purana (also called the Srimad Bhagatam) have to power to literally open doors for you into other realms, into the worlds of Krishna’s eternal Love. Then I began to find books that explained my experiences and saw how for centuries people have been enjoying this path of Bhakti Yoga with Krishna that he so kindly left for us – a sort of footprint map through the perils of the Kali Yuga. Modern historians and science seem incapable of understanding the reality of the Invisible Realms and how deeply we are all connected to the worlds. Keep in mind that Krishna is God incarnate in human form. He was always completely aware of who he was and was never confused by MAYA as we are. In the Bhagavad Gita Krishna says that he ‘dwells in the Heart’ of each and every one of us. To me this means that Krishna identifies himself with the God-within us awakened in human form. Krishna consciousness is us when we wake up and become aware of the God-within us. This is the enlightenment we all seek: God Realized in Man. What follows are a few of the enticing, charming, delightful descriptions of what I lovingly call ‘The Big Blue Guy’ from the Bhagavata Purana. I hope they will open you to another way of perceiving God, as they did for me. God is Everything – VASUDAVA SARVAM ITI! You have the deliriously happy freedom to love God in many, many forms. And as millions of devotees have known for 1000s of years, Krishna is simply awesome! … perceived Sri Krishna coming out of the gates of Mathura like the rising Moon, most beautiful to look at, dark in complexion, clad in yellow silken garment, with the Sri-vasta mark on his bosom [chest], with his neck beautified with the pendant of Kaustubha gem, having four mighty long arms, and eyes like fresh-blown lotus, ever beaming joyousness, with splendid, beautiful cheeks, bright with smile and lotus-like countenance, with dazzling alligator-shaped ear-rings. Verse 1. Perceiving that those nights, indescribably beautiful and hence proper for indulging in delightful sports, were beautified with full blown jasmines … the glorious Lord [Krishna] in exercise of his Supreme yogic Maya potency, made up his mind to play (Rasa). 3. Beholding the moon, the friend of the lilies which blossom at the touch of his rays in full orb, reddish like fresh saffron, superbly resplendent like the countenance of goddess Lakshmi [Vishnu’s consort], and seeing the groves of Vrindavana lit up with its soft rays, he breathed forth such melodious music through his flute as to captivate the hearts of the beautiful-eyed Gopis. 4. Hearing that music, which increased their love for him, the damsels of Vraja whose hearts were captivated by Krishna … arrived hastily … at the spot where their Lover was waiting. … there thronged in the sky hundreds of heavenly cars of celestials with their wives whose minds were carried away with curiosity of seeing the Rasa dance.… kettle-drums were sounded and showers of flowers fell. … Exceedingly beautiful shone the glorious Lord … [the Gopis] enamored of loving devotion to Krishna and thrilled with delight at the touch of Krishna … sang … filling thus the whole universe with the music of their song. Verse 4. Finding her [Rukmini] consort’s [Krishna] force covered with showers of arrows, the slender waisted bride, her wyes agitated with fear, looked at her Lord’s face bashfully. Verse 26. Quickly springing down from the couch, the four-armed Lord lifted her up and gathering up her locks of hair, gently wiped her face with his lotus-hand. 27. He wiped her eyes, which were full of tears and her breasts soiled with her tears of grief. He hugged in his arms his chaste and faithful consort who was exclusively and absolutely devoted to him. Verse 40. Having seen their beloved Krishna after a pretty long time, they yearned to gaze at him continuously without the interruption of winking of the eyelids and so they blamed the Creator who created the eyelids and thus interrupted, even for a wink, his vision. Mentally they closely embraced him, who was ushered into their hearts through their eyes, and instantly became merged in him – an accomplishment not within the easy reach of Yogins who always practice to attain one-ness with him through Yogic meditation. Verse 5. 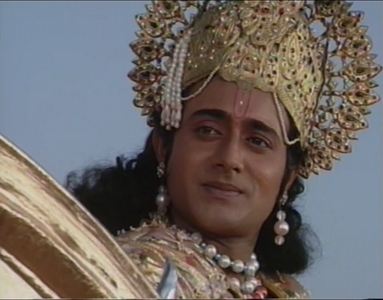 O Supra-sensuous Lord! Having created this universe of a diversified nature out of yourself, you enter it as its soul, the Indwelling Controller, and you, the eternal unborn Lord, become the active force (Prana) and the cognitive force (Jiva) and maintain it. 7. The lovely light of the moon, the heat and glare of the fire, the brilliant splendor of the sun, the twinkling of the stars and the streaks of lightning, the stability of mountains, the fragrance that characterizes the earth --- all of these special characteristics are as a matter of fact yourself only.